Lebanon sits on the eastern shores of the Mediterranean Sea, and had their own waves in history, which in turn contributed to its cultural, ethnic and religious diversity. Encompassing a perfect balance of fresh fruits and vegetables, meat, grains, fat and dairy, the Lebanese cuisine is rich, with the most beautiful flavors. It is as diverse as its cultural history, heartwarming and at the same time healthy. This dish gets its name from the Ottoman pasha Daoud/Dawood/Daud who administered Mt. Lebanon in the 18th century. Daoud Basha was known to be tyrant, but other than that, I could not find any more information. A despot he might have been, but he definitely had good tastes for food. If this dish was his favorite or if it was something is created is probably not in the records. But the recipe had obviously been recorded and passed on. The dish is also known as “Kebab Hindi” in some place. 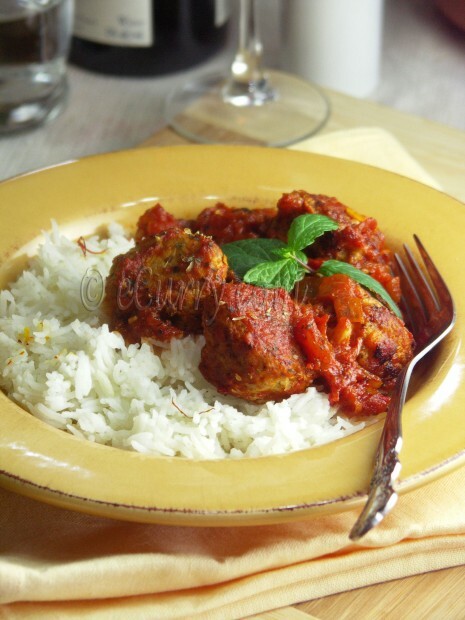 I am not exactly sure why, but I do think it is very similar to the Indian vegetarian/meat kofta recipes, as most koftas in India are cooked in some kind of a sauce of tomato and onion. Almonds or cashews are used in place of pine nuts. Like any other Lebanese food, the flavors in this dish are complex. It is not very complicated to prepare, neither does it take too much time. It is beautiful dish with raisins and pine nuts and the sauce is rich and aromatic. I have adapted this recipe from a source I have mentioned below, along with some changes to the spices and the texture. I have used some raisins with the pine nuts, as I have used a lot of red pepper. The hint of sweet of the raisins pair well with the spice level. I have added saffron to the sauce for some extra flavor. I wish I had saved some pine nuts to garnish the dish when served, but I did not. And while in this recipe the pine nuts and the raisins have been combined with the minced meat, a more elegant way to do it would be to stuff the meat balls with them. Wash the rice till the water runs clear. Soak for about 15-20 minutes and drain. Soak the saffron threads in the warm milk. Heat a knob of butter in a pan. Add the drained rice and stir fry moving the rice around quickly, till the butter coats the rice grains. The rice will glisten. Add the salt and the the milk with soaked saffron. Stir it around for a couple of minutes. Add water (1.5 cups of water with 1 cup uncooked rice), & boil at high heat till the water from the top disappears, but there is still more water in the pot. Reduce the heat to lowest possible and immediately cover the pot tightly. After 5 minutes, switch off the heat, but leave the cover on the pot till ready to serve. 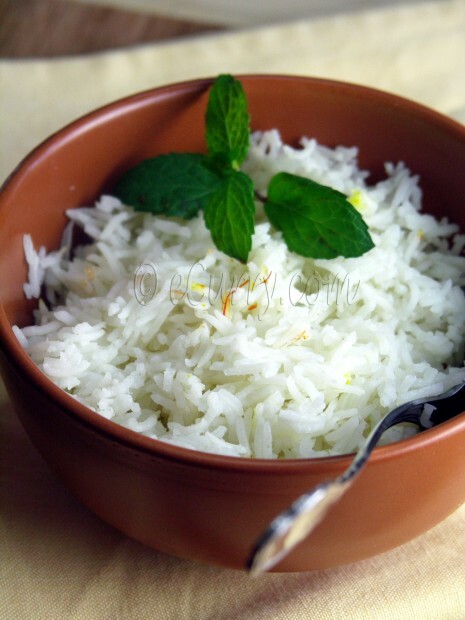 When ready to serve, fluff the rice with fork. Coat a pan with oil and lightly fry the pine nuts, till they are golden. Remove from the pan, and set aside. Place the mince in a large bowl. Combine all the other ingredients for the meatball other than the oil. Add the toasted pine nuts. Mix and mulch with your hands and divide then mix into walnut size balls; will make about 20-24 balls. Roll between wet palms of you hand to give them a spherical shape. Place them on a plate in a single layer. Cover with clingfilm and chill until required. Heat a flat bottomed pan and drizzle some oil on the pan. Shallow fry the meatballs in the hot oil rolling around until nicely browned, then reducing the heat to cook through. Do not over crowd them. Oven Method: Grease a baking tray and bake the meatballs for about 20 minutes at 375 F, or until they start to brown and are cooked through. Drain the meatballs on a kitchen towel. Set aside. If you are using fresh tomatoes, puree them in a blender. Heat the olive oil in a pan and stir in the onion and garlic. Cook at high heat till the onion starts to soften and turn golden. Add the tomato puree or the crushed tomatoes to the pan. Stir in the sugar, black pepper, oregano, chili flakes, salt and sugar into the tomatoes and onion. Simmer for 5-7 minutes and then add the pomegranate molasses and saffron. Cook partially covered for about 12-15 minutes till the sauce starts to thicken. Place the meatballs in the tomato sauce in a single layer, and cook for another 10 minutes or when there is just enough sauce to coat the meatballs and a little bit more. (You can cook for less time if you want a thinner sauce). Serve with rice pilaf and some salad and yogurt on the side. This is going to the Meeta’s Monthly Mingle, hosted at the Dirty Kitchen Secrets. The theme obviously is Taste Lebanon. I am sitting here drumming my fingers on the table waiting for you to serve me up some of this delicious food. That is a delicious looking dish”So comforting too. I love your plate. Eto shundor chhobigulo dekhe jibe jal eshe gelo. The meatballs look so moist and flavorful. My mouth have already started to water by looking at the meat balls. Superbly made and very well presented. Tomader pujor prito shubecha janai. Khoob anando koro. Great recipe Soma. Flavours sound delicious. I love Daoud Bacha and your photos are making me hungry!! Am just drooling over that plate of tempting daoud basha..
Wow, looks divine Soma! 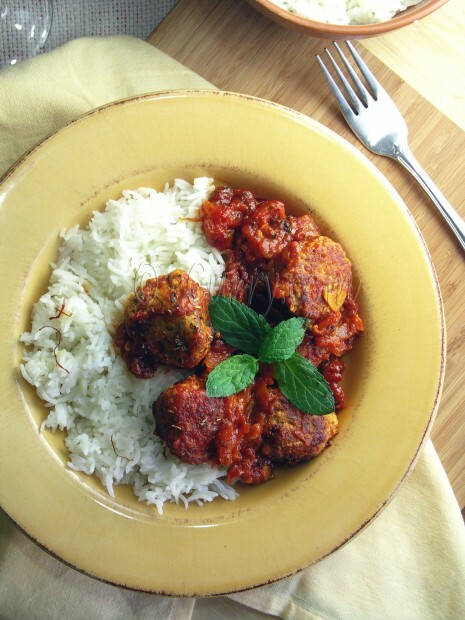 I recently made koftas at home but adding pine nuts to the meatballs is a great idea. Will try them! We love meatballs in our house. So I will surely try this recipe Soma. Looks and sounds delicious. 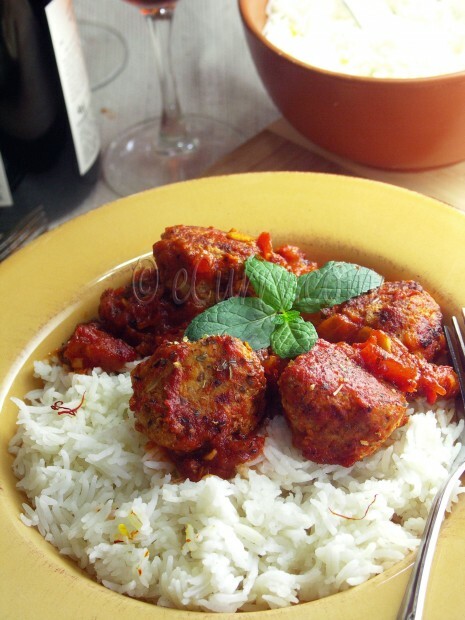 I always think vegetarian kofta recipes sound amazing, but am too lazy to make them haha. seriously mediterranean food is something that sings to me. eta darun baniecho…ki sundor dekhte hoeche. pujo’r ki plan? bazar korle? okhane pujo hay nischoi. khub bhalo katio pujo tomra sakkole mile. between amar blog e akta award ache tomar jonyo. dekho kintu. I made meatballs recently but found them lacking a little something…Your recipe looks like it’d fill that gap! oh soma trust you to make such a wonderful and comforting dish for the monthly mingle. so glad to see you are taking part! love the pics! 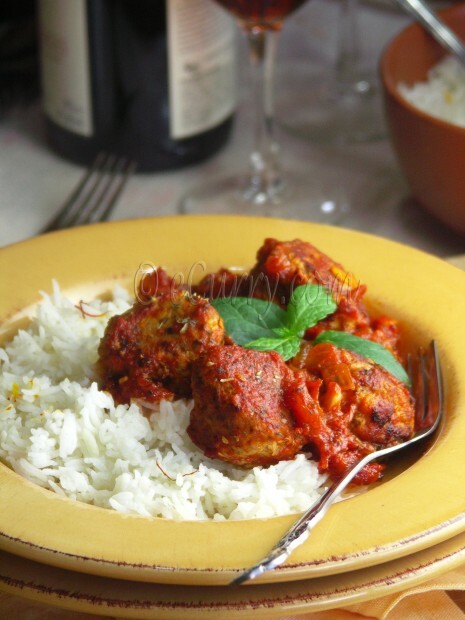 Gosh these look good – you can never have enough meatball recipes in your recipe file or curries for that matter. So glad to have found your site via the Monthly Mingle.